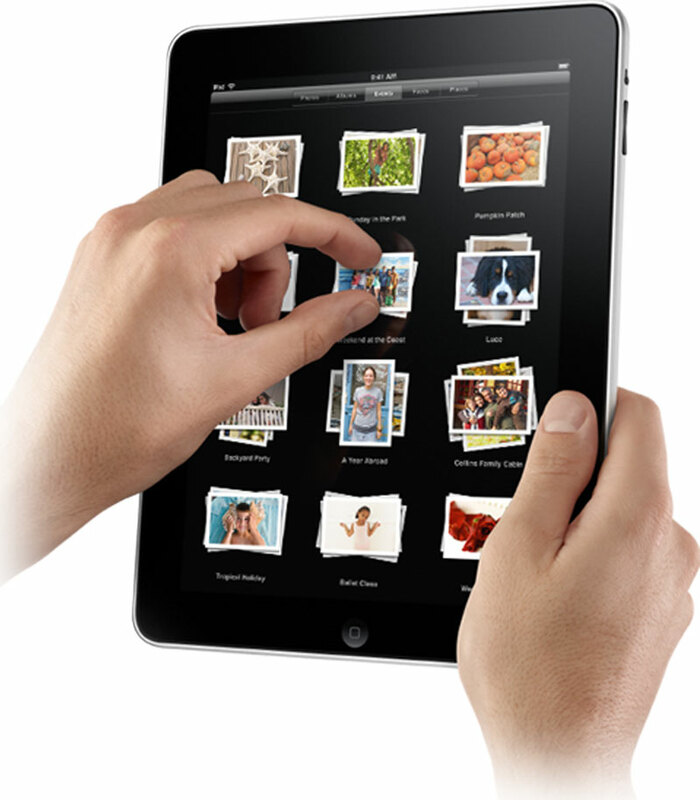 Yesterday Apple officially showed off their revolutionary all-new tablet form-factor known as the iPad. Some people say it is a huge iPhone, and others say it is like a small laptop. I think it is much, much, much more than just an oversized iPhone. I believe it will completely revolutionize digital publishing and if you are a fan of Jake's Rolex Watch Blog it will revolutionize the way you enjoy it. 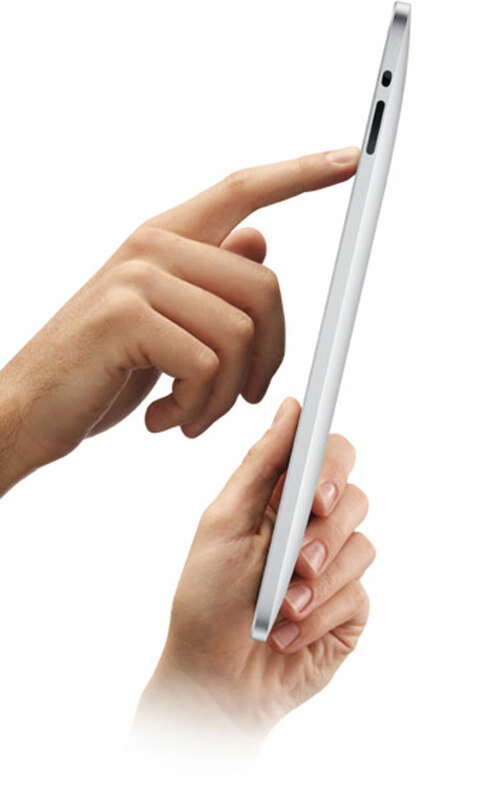 The coolest part about the iPad form factor is that is only weighs 1.5 pounds and is a half-inch thin. It also has a 1024 x 768 screen with 132Pixels per inch on its IPS LED backlit LCD panel which means it will look great!!! 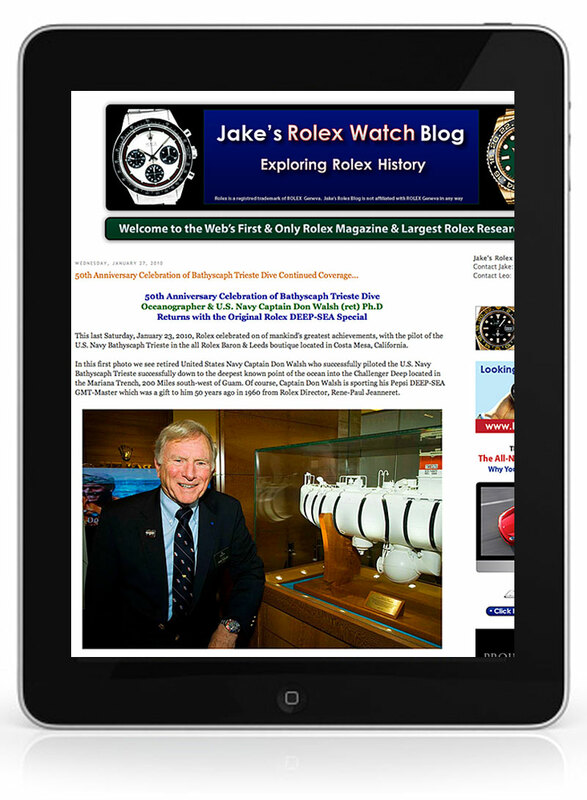 In my mind, Jake's Rolex Watch Blog is the only real online magazine on the web. I did not say I thought it was the only Rolex magazine online, I said it is the only actual online magazine. Most online magazines have tiny images you have to click on and reading a detailed story requires you to click through many, many pages. Jake's Rolex Watch Blog is the only large format photo magazine I know of on the web. To me it is like combining the best of the old LIFE Magazine with National Geographic and People Magazine, all with huge colorful photos that tell the story well. Readers ask me all the time if I intend to do print books and the answer is NO!!!!!!!! You can't update books with new information and books don't allow you to listen to podcast interviews or watch high-resolution movies. Books are also expensive and terrible for the environment. Don't get me wrong, I like books, I just personally prefer to view content digitally and that is what is so great about the iPad. You can sit in front of the fireplace on a cold winter evening and surf the web, or read about great Rolex history on Jake's Rolex Watch Blog. So let's take a closer look at the all-new Apple iPad. It starts at just $499 for a 16GB version which is amazing!!! Depending on how you spec it, you will be able to spend up to $829 for one with 3G and 64GB of Storage. All iPad models come with 802.11n wi-fi which is fine for people who don't travel much, but if you commute or travel a lot, you can get an unlimited 3G data plan for only $30 per month, or if you don't need that much bandwidth, they offer a 250MB plan for $15 per month. The cool thing is that neither plan requires any kind of contract, so you can turn it on and off whenever you want. ATT is also offering free WiFi spot access for iPads. On of the unanswered questions is how much is ATT going to charge for iPhone tethering? I imagine it would be close to the same pricing as the options for the iPad, so if you already have and iPhone, when ATT begins offering 3G Data tethering it might make more sense to use your iPhone 3G connection for the iPad, because you could also tether it to a Macbook or other laptop. The iPad works just like an iPhone in the sense that you use your fingers to do just about everything. As you can see from the photo below, the form-factor is stunningly cool, simple and elegant. 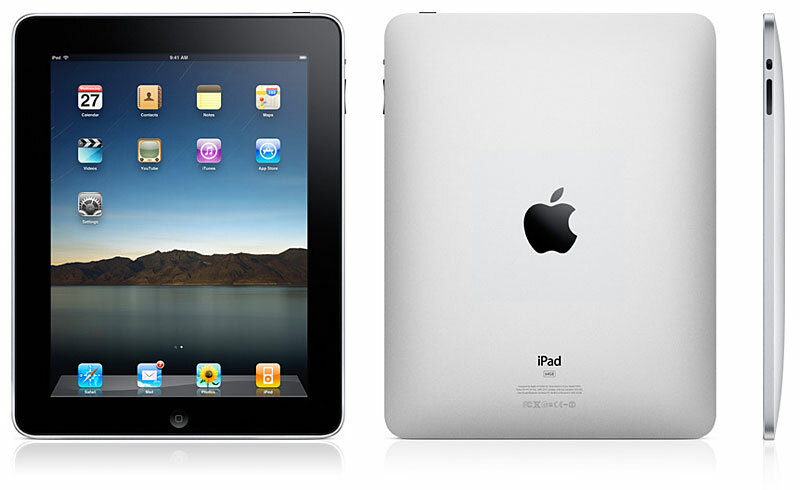 The iPad measures 7.5 inches wide x 10 inches tall x .5 inches thick. 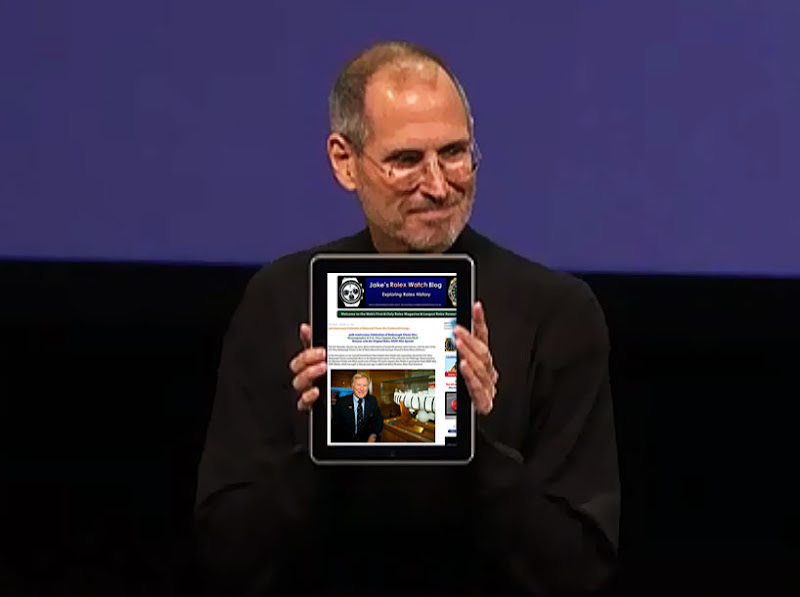 As you can see in the following images, the all-new iPad should be the ultimate web-surfing device. One of the obvious question is whether or not the iPad can really replace a laptop? I think the answer is simple. It really depends on what you do. I would never try to publish Jake's Rolex Watch Blog using an iPad, but if you just surf the web and do light email, it should be great. I believe among other things, the iPad will slaughter the Netbook market and a good part of the laptop market, including Apple's own Macbook line. I think the iPad will be really popular with guys, but also very popular with women because they can easily travel with it in their purse. This is a huge benefit for the ladies because they no longer have to carry around a separate goofy laptop bag. I think it will also be great as a digital book and magazine reader. In other words, the Amazon Kindle book reader just got blown to smithereens!!!! Just one of the amazing advantages the iPad has over the Kindle is that it has a vivid color backlit screen v. the Kindle having a stupid, small, black and white screen with ZERO backlighting. 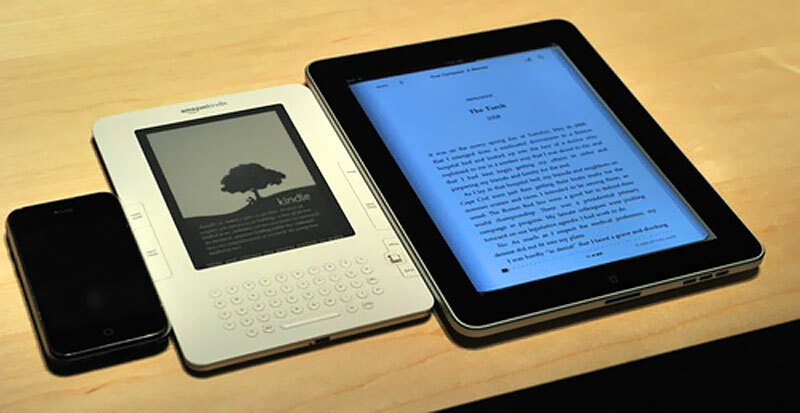 In other worlds, if you want to read in bed at night in the dark with the Kindle, you can't because it has no backlight, whereas the iPad has an ultra-bright, super-high-contrast screen with strong LED backlighting. Not to mention, the iPad is black with a fine chromed edge with an aluminum body and real glass where the Kindle is all plastic and beige!!! Beige is so 1995!!! In this next Sizemodo comparison from Gizmodo, you can see a great size comparison between the Apple iPhone, Amazon Kindle and Apple iPad, which obviously speaks volumes. Also, if you are a serious photographer, you can use the iPad as a portable digital photo viewer and storage device, so you can travel light, but still be able to check out your images as well as be able to upload or email them. In the future I will write a review of the iPad to share my real-world observations with you, but I think the iPad is going to revolutionize computing and digital publication. Apple has a great overview movie and you can also watch the Steve Jobs iPad Introduction Keynote with took place in San francisco. The iPad also runs almost all of the 140,000 currently available iPhone apps!!!!!!! Here is a video from Engadget that shows how blazingly fast the iPad is. Apple brough a company that made its own chips so Apple could design their own chips and the fruits of that effort are in the iPad. Namely the all-new Apple i4 Processor, and man does it fly!!!!!!! By the way, for anybody that complains that the iPad lacks cameras or any other significant features, remember that Leonardo da Vinci said that "Simplicity is the ultimate sophistication" and I argue it's smart of Apple to make the 1st generation version as bullet-proof and simple as possible. They can, and will add additional functionality in future generations. "What this thing can do is Mind-Boggling!!!" Tim Gideon, from PC Magazine reviewed the iPad and said "First off, what this thing can do is mind-boggling!!!" He continues: "New apps and games developed specifically for the iPad do amazing things with the additional screen real estate, but if you think it's just a toy, you're wrong." The iPad heralds in a whole new generation of computing. Basically, in the world of computing and publishing, the ceiling just became the new floor. It is almost difficult for me to express in words how profound the impact the iPad will have on the world will be!!! 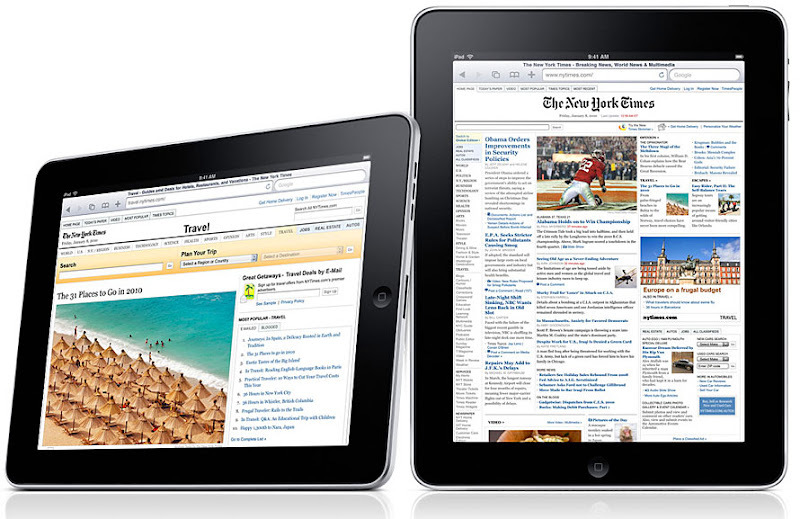 No, the iPad is not just another Microsoft Tablet, or a netbook killer. The challenge in the past, the iPad overcomes is with the ultra-simple and fun user-interface, coupled with an extremely cool looking aesthetic and a lightning fast processor that allows everything happen in real time. For instance, in the book reader, you go to turn the page, and it turns just like a real book–in other words, there is zero delay. Not to mention, there is almost zero learning curve and if you have an iPhone or iPod touch, there is zero learning curve. First, let's examine the impact it will have on education. There is or was a movement in the world named One Laptop Per Child. The idea, is that if somebody could figure out a way to make a very simple laptop that was indestructible and dependable, and would cost only $100 to make, that if every child on planted earth received one, it would not only level the playing field, but significantly improve the overall education level or humanity, in the short and long term. The notion that a rising tide should lift all boats. The idea was noble, but the actual product left much to be desired. Fast forward several years to the iPad. I argue the iPad delivers on the dream of 1 Laptop Per Child, except it will be 1 iPad Per Child, not only in wealthy countries but it will also become the standard in third world countries. Why? Because the iPad will replace ALL school textbooks, and even paper for taking notes, and even using as an art tool for doing things like finger-painting and drawing. The current iPad with 16GB of RAM and Wi-Fi is only $499 retail, and with a student discount it will probably be $449. With Moore's law, and a very-high adoption rate, the same model a year from now will be half the price. In two years, following Moore's law and with economies of scale, the same machine will probably retail for around $125 and eventually $100. Instead of children breaking their backs with a backpack full of heavy, expensive books, and notebooks, they will carry just an iPad. Teachers will be able to create and distribute coursework digitally over the internet. Probably the most important thing, is all students gain the ability to simply educate themselves with extremely powerful tools like Wikipedia. Pretty soon, for the first time in history, we will have a level playing-field where the only limitation to anybody's education will be their curiosity and desire to learn. Imagine all the paper and toxic ink that will be saved by distributing books and magazines so they can be read on an iPad!!! Also, you can't read a book, or magazine or newspaper in bed in the dark in bed, or on a dark airplane, but you will be able to with the iPad. Leo and I are in the process of significantly overhauling every aspect of Jake's Rolex World and we will be optimizing EVERYTHING around being as easy as possible to use on the iPad. Think about the possibilities!?! Today, I know many Rolex Authorized Dealers send their employees and sales-people to Jake's Rolex World to educate them about Rolex history which gives them many excellent stories they can pass along to customers, not to mention it allows them to speak more intelligently, insightfully and passionately about Rolex. AD's also have their sales-people listen to our podcasts to improve their understanding and knowledge of Rolex. We are also underway with an extremely ambitions project to build a world-class database and Rolex Reference Library that will contain high-resolution photos of every Rolex ever made, all shot in 3-D, so you as an end-user will be able to spin them around and examine all the great detail. As and end-user you will be able to view Everything Rolex however you wish. So as an example, you will be able to view all the Rolex historical ads, by model, or in chronological order. The coolest aspect is that, we will be taking an open-source approach, so anybody will be able to contribute to or benefit from the library. What does this have to do with the iPad? 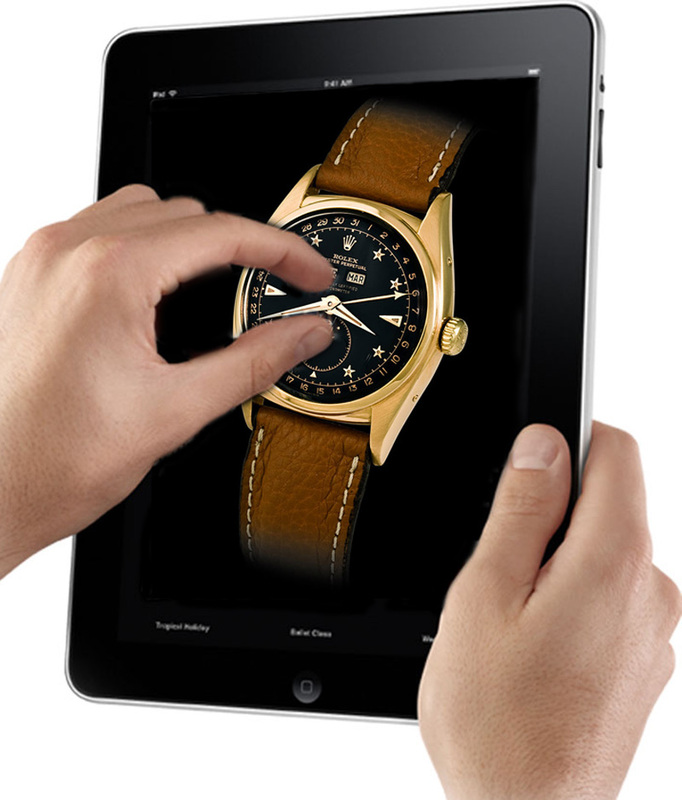 I imagine the Apple iPad as being the ultimate tool for exploring all this rich Rolex History. If we get half-way, where we intend to go with this project, everybody, including AD's, Vintage Rolex Dealers, and Collectors and Enthusiasts will all be able to access everything from one kindergarden-simple User-Interface, from the web, on an iPad. And yes, it has crossed my mind to bundle this all as an iPad application that can be accessed on the iPad without a persistent internet connection, and of course, whenever you wished to update the app data, so long as you have an internet connection, you would be able to. The greatest challenge is that I am absolutely committed to keeping all this rich history and data free to everybody. If it is not free to everybody, it is not worth doing. The days of exclusivity are over. Taking an inclusive approach is where the best days ahead will be found. The online Rolex community is still very-much in its infancy, if not still in the incubator, but it never ceases to amaze me how powerful a tool the internet has become as a mechanism for sharing valuable information and making new friends who share our interests. These are truly amazing times to be living in, and I believe the Apple iPad will go down in history as the most revolutionary platform that completely transformed and delivered on the promise of the internet and computing in general, as well as the helping humanity achieve much higher levels of knowledge, understanding and education!!!! Sir Patrick Stewart who was the Captain on the Star Trek does not like Twitter, but Methinks he will love the iPad!!! It is fascinating to consider the dude who played the captain of the Enterprise on TV had all these tech-toy props that showed how cool the future would be, then fast-forward a few short years later and he is an iPhone junkie and he is talking about how the iPhone is so much more powerful than anything from Star Trek!?! Live long and prosper!!!! Walt Mossberg, Michael Arrington & David Carr had the chance to sit down with Charlie Rose and discuss the implication of the future for the iPad. Update: Here is Wired's idea of how their magazine will look on the iPad using software named Wired Reader which uses Adobe Air. I am not certain how they plan to run this application on an iPad, since Apple does not appear to intend to support Adobe Flash on the iPad. On Jake's Rolex World Magazine we intend to use the exact same user interface for the Desktop/Laptop version as well as the iPad. It does not make sense to me to have to have 3 or 4 different versions of the same "Experience." In the next two videos we see the CEO of Penguin books, John Makinson talking about the future of his books and in the video below he shows off just how amazing an ebook can be on the ipad!! !